Creosotebush is the subject of Native American legends. Pima and Tohono O’odham elders relate that Earth Maker rolled out the soil like a tortilla and shaped it into a small mound for creosotebush. The bush housed a small insect that grew its own gum-like substance for a shelter. This substance, called lac, was gathered by Earth-Maker while he was singing and shaping the mountains. This is why the mountains and the earth became hard (Nabhan 1985). Creosotebush is an aromatic evergreen shrub that grows in the lower Chihuahuan, Sonoran, and Mojave deserts. It tolerates droughts better than any other shrub in North America, and can survive without rain for up to two years. The lovely yellow flower blooms throughout the year after rains. 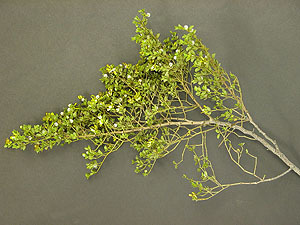 The foliage gives off a distinctive and refreshing odor after a rain, hence the common name creosotebush (Mabry et al. 1977; Powell 1998). It is also one of the longest-lived plants in the world, with some root system or stands surviving throughout much of the Holocene (Robichaux 1999). Tachardiella larreae is a small scale insect that lives on creosotebush and secretes a gum-like substance commonly referred to as lac (Mabry et al. 1977). Lac is often referred to as gum or resin in ethnobotanical or historical accounts, and this material was quite important to Native American technology and healing arts. Archeology. Creosotebush was recovered from Late Archaic deposits in Hinds Cave (Dering 1979). Bohrer (1981) reported creosotebush fruit from Fresnal Shelter near Alamogordo, New Mexico. Complete branches of creosote were noted from Tres Metates rockshelter (41PS915) in Presidio County (Dering 2006). Chemical composition. Creosotebush resin contains over 80 percent flavonoids and nordihydroguaiaretic acid as well as waxes and other phenolic compounds. As a result, creosotebush can be both a toxic and a healing agent. The chemicals in creosotebush roots and leaves inhibit the growth of other plants (Mabry et al. 1977). It can be toxic to herbivores and exhibits allelopathic activity that inhibits the growth of other plants around it. Creosotebush produces certain herbal medicines that may be active against viral infections, and it has anti-inflammatory qualities that are utilized to treat rheumatism. Creosotebush was noted to have antiseptic qualities and was mentioned in the Pharmacopoeia of the United States until the middle of the 20th century. Today the medicinal qualities of creosotebush are somewhat controversial. As always with strong medicines, the toxic qualities and the healing qualities must be carefully considered. The following comments are limited to a history of Native American uses of the plant. Medicine. Please do not try any of these remedies without professional consultation; creosotebush contains quite an array of powerful chemicals that can cause damage to human systems. That said, Curtin (1984:62) reports that the members of the Women's Club on the Salt River Reservation said that "this plant cures everything, and that's what nature gave us." With this testimonial, we now explore the many medicinal uses of creosote. Respiratory ailments. The crushed leaves and lac are utilized to treat respiratory colds, sore throats, and even tuberculosis. The Pima prepared a decoction of the lac, and the Cahuilla used an infusion of the leaves to treat the common cold. Sore throats were treated using a decoction of the leaves as a gargle. An effective decongestant, the steam rising from boiling the leaves was inhaled by the Cahuilla and the Hualapi (Bean and Saubel, 1972; Curtin 1984). Anti-inflammatory, anti-rheumatic. Creosote is used to treat aches and pains of both the joints and muscles. The Diegueno, the Cahuilla, the Pima, the Papago, and the Yavapai all claimed that creosote had anti-inflammatory, analgesic qualities. Application varies from bathing in a decoction of the leaves to applying a poultice to the sore area. The Pima heated the leaf-bearing branches and bound them to the part of the body that was in pain. The Cahuilla made the leaves into a liniment (Castetter and Underhill 1935; Gifford 1936; Hedges and Beresford 1986). Gastrointestinal. Here we get into more delicate applications of this herb. The Papago, Pima, and the Cahuilla all used it to treat various forms of gastric upset. Both the lac and the leaves were made into decoctions or infusions and administered orally. There are specific mentions of its use for its calming effects on the bowels (Bean and Saubel 1972; Curtin 1984). However, in some cases they used it as an emetic; the distinction is apparently related to dosage (Bean and Saubel 1972; Russell 1908), thus there may have been a fine line between the calming effects and some very disturbing effects on the bowels. Skin. Poultices, decoctions, and infusions of the leaves and lac were utilized to treat a broad range of skin disorders, as well as cuts, abrasions, and boils. Some disorders also were treated by applying the dried and pulverized leaves. It is apparent that creosotebush had both antiseptic/disinfectant and astringent capabilities. Pima and the Cahuilla used infusions or poultices to treat wounds and skin abrasions. The Pima also used creosote to treat skin diseases such as impetigo. The Cahuilla applied a powder made from the leaves to wounds for its antiseptic qualities. The Pima applied the powder to a newborn's navel to promote healing (Bean and Saubel 1972; Curtin 1984). The Pima applied the powder and the leaves to the skin and feet as a deodorant (Curtin 1984). Miscellaneous. 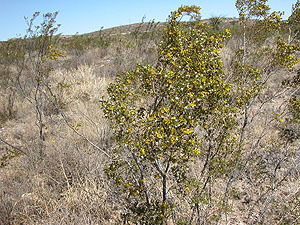 Creosotebush leaves were used for general oral health, including as a treatment for toothaches by the Pima (Curtin 1984). Also, the Pima used the decoction to treat fevers, to treat dandruff, to treat gas, and to treat saddle sores on horses. Tools. Resins of the lac were applied to the hafts of tools by the Cahuilla, the Panamint, and the Kawaiisu (Bean and Saubel 1972; Kirk 1952; Zigmond ). Creosotebush is an open, many branched shrub that often contains stems straight enough to be fashioned into arrow shafts. The Papago used creosote wood for arrow shafts used to hunt small game, and to make foreshafts for arrows used in battle (Castetter and Underhill 1935). 1972 Temalpakh: Cahuilla Indian Knowledge and Usage of Plants. Malki Museum Press. Morongo Indian Reservation, Banning, California. 1981 Former Dietary Patterns of People as Determined from Archaic-Age Plant Remains from Fresnal Shelter, South Central New Mexico. The Artifact 19(3-4): 41-50. 1935 The Ethnobiology of the Papago Indians. Ethnobiological Studies in the American Southwest. Vol. II. The University of New Mexico Bulletin, Biological Series 4(3). Albuquerque. 1979 Pollen and Plant Macrofossil Vegetation Record Recovered from Hinds Cave, Val Verde County, Texas. M.S. thesis, Texas A&M University. Published by the Department of Anthropology. 2006 Plant Remains from 41PS915, Tres Metates, a Rockshelter in Presidio County. Report submitted to the Center for Big Bend Studies, Sul Ross State University. Alpine, Texas. 1936 Northeastern and Western Yavapai. University of California Publications in American Archaeology and Ethnography. 34:247-354. 1986 Santa Ysabel Ethnobotany. San Diego Museum of Man -- Ethnic Technology Notes no. 20. San Diego, California. 1952 Panamint Basketry. The Masterkey 26:76-86. 1977 Creosote Bush--Biology and Chemistry of Larrea in New World Deserts. Dowden, Hutchinson and Ross. Stroudsburg, Pa.
1985 Gathering the Desert. University of Arizona Press. Tucson. 1999 Ecology of Sonoran Desert Plants and Plant Communities. University of Arizona Press. Tucson. 1981 Kawaiisu Ethnobotany. University of Utah Press. Salt Lake City. Creosotebush near Langtry, Texas. Photo by Phil Dering. Creosote branch with flower and fruit. Photo by Phil Dering.